Does the sale of ‘clean’ antiquities encourage the black market? Ethical questions. 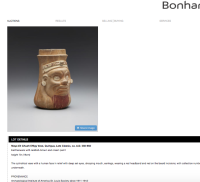 Sad news from Bonham’s annual African, Oceanic, and Precolumbian sale (due to take place in New York on 12 Nov). Well, sadder than usual. The amazing folks with the Maya Research Program (go on their field school; donate!) brought this to my attention. I am in the middle of moving house so it probably won’t get commentary it deserves here but I didn’t think it could wait. 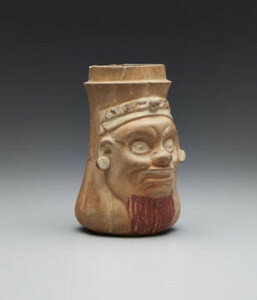 The Archaeological Institute of America St. Louis Society, has consigned for sale at Bonhams Auction House a Maya Effigy Vase from the spectacular site of Quiriguá, Guatemala (Lot 156, est. US$ 6,000–8,000) and a Zapotec Figural Urn from the site of Monte Albán, Mexico (Lot 149 US$ 3,000–5,000). These antiquities are a rare case of absolutely legal Mesoamerican objects in the United States. I cannot remember the last time that I saw ‘clean’ Mesoamerican antiquities for sale. Why? Because nearly all of the Mesoamerican pieces collected before their countries of origin enacted legislation against said practice were done in such a way that they entered public collections. Public collections rarely sell their pieces. We’ve hit on the problem. Any attempt by museums or archaeological societies to profit from sales of antiquities provides incentives for global criminal activity that can lead directly to the loss of the art they claim to value. What would Petrie do? It seems not sell this stuff. The story was picked up by the media and, at the very last moment, the Metropolitan Museum of Art bought the collection and the day was (sorta, kinda) saved. But not really. All this still happened. And, clearly, it is still happening. These Mesoamerican items are on the market, with their sterling provenance. They will likely go into a private collection and they will inspire future sales of dirty Mesoamerican antiquities. And, let me repeat, almost all of the Mesoamerican antiquities on the market are dirty in some way. There is something else that bothers me about this. 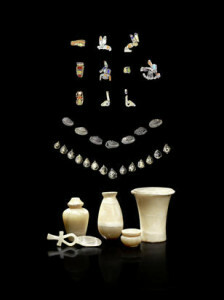 Everyone had a collective freak out when the Egyptian objects were put up for sale. 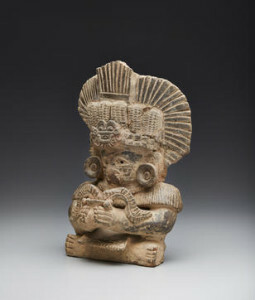 I hate to say it, but I don’t think we will see the same outcry about these Mesoamerican pieces. That the (white, western) world has a fit over Greek/Roman/Egyptian antiquities, and largely considers the cultural objects created by “the Other” (brown people) an afterthought is something that I have written about. Perhaps that is a bit harsh, but I can promise you, it is less likely that we will see newspaper articles about this and less likely that we will have the Met swooping in to ‘save’ these pieces. So, media, if you want someone to speak about this issue with a Mesoamerica focus, drop me an email. Morley very near to Quiriguá at their rival site, Copan. I am half asleep, but I’ve been trying to dig up who these objects came from. I knew that Sylvanus G. Morley, a true archaeological god, was digging at Quiriguá during the time that the objects entered into the St. Louis AIA collection. Having a hunt around, I found that according to Wendy Ashmore (2007:7), the Quiriguá excavations conducted by Morley and Edgar L. Hewett from 1910 on were actually sponsored by the St Louis chapter of the AIA. Now I can’t say for sure that is where this/these items came from, but there is obviously a connection. Clarification welcome. Part of the ‘hurt’ of the sale of the Egyptian pieces were that they were excavated by the famed Flinders Petrie. 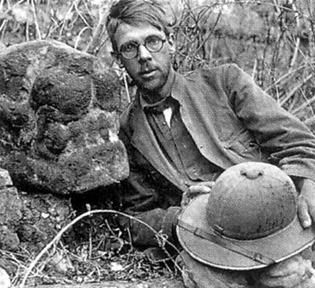 For those of you who don’t work in the Americas, Sylvanus G. Morley is almost as much an archaeological deity. To have something he excavated go up on the block feels the same as losing a Petrie piece (only more personal in my case).